Depression is today considered the biggest reason for ill health across the world. India bears a huge burden of this problem: 4.5 per cent of the country’s population suffers from depression compared to just 4.3 per cent people globally. The common triggers for depression are stressful life events, death, new job, relationship problems, psychological issues, genetic predisposition and neurotransmitter abnormalities. But these factors are uniform across the world and do not explain the higher levels of depression in India. To find the answer, one just needs to figure out what India has more than the world. As an organisation working on environment, we try to see every problem through the prism of environment. A quick search throws up cutting-edge research to link environment with depression. A recent study published in the Environmental Health Perspectives suggests that exposure to air pollutant PM 2.5 was associated with depressive and anxiety symptoms. This association was the strongest in poor people and those who were already sick. 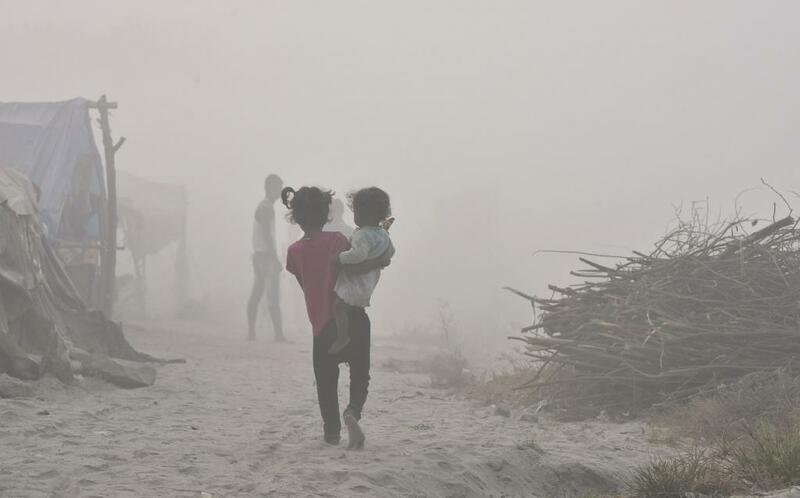 The study says that PM 2.5 exposure leads to inflammation and oxidative stress, which causes mental health problems. The study was carried out in the US using data from the National Social Life, Health and Aging project. Noise from traffic, which is also a kind of pollution, also leads to depression, as a study carried out in Germany shows. Data from 3,300 participants in the Heinz Nixdorf Recall study showed that exposure to residential road traffic noise increases the risk of depressive symptoms. But air pollution is not the only environmental trigger when it comes to depression. Another study in Environmental Health Perspectives shows that there is a link between pesticide exposure and depression. The researchers found that fumigants aluminum phosphide and ethylene dibromide; herbicide 2,4,5-T; the organochlorine insecticide dieldrin; and the organophosphate insecticides diazinon, malathion and parathion were positively associated with depression. The study used data from the Agricultural Health Study in the US. Indian farmers are using more pesticides than their US counterparts. More literature search reveals that even climate change is taking a toll on mental health, according to a report by the American Psychological Association and ecoAmerica. Both disasters and long-term climate change can lead to depression, the report finds. Similarly, the food we eat has strong links with mental health. A study has also linked consumption of high-fat foods to depression. The study, published in the journal, Biological Psychiatry, suggests that a high-fat diet alters the mix of bacteria in the gut and leads to mental illness. To strengthen this hypothesis, we have a study by researchers in Australia who have demonstrated that a diet rich in whole grains, fruits, vegetables, legumes, low-fat dairy, raw unsalted nuts, lean red meat, chicken, fish, eggs and olive oil can treat symptoms of depression. The researchers suggested that food such as sweets, refined cereals, fried food, fast food and processed meat should be minimised. Policy makers and advisory bodies across the world have more resources at hand to find out the causes which lead to depression. But if a presentation circulated to the media by the World Health Organization’s (WHO) country office for India on the occasion of the World Health Day is an indication, the factors mentioned above are not on the radar. 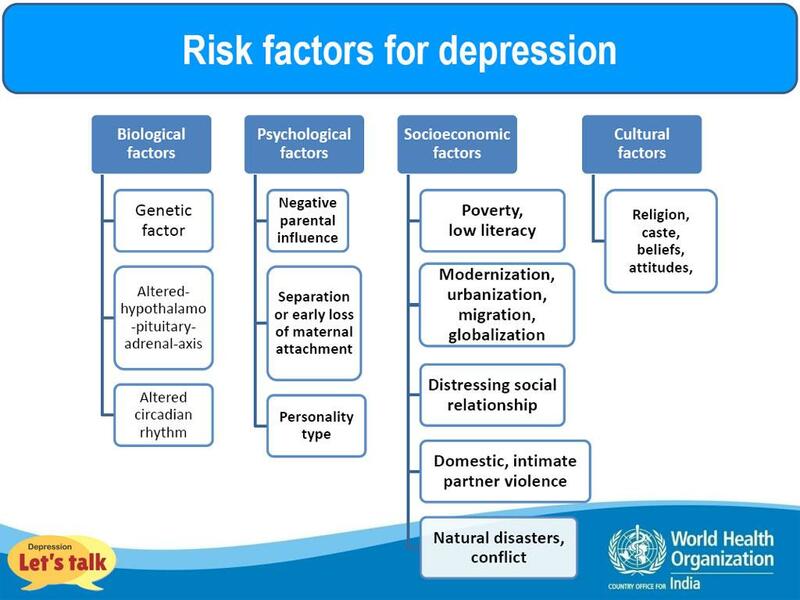 These facts are not among the risk factors for depression mentioned by WHO.